I've said it before, you can paint anything. I've proven that over and over. I've painted walls, floors, fireplaces, pleated blinds (yes, with spray paint), doorbell cover, etc. Now I can add laminate counters and mirror tiles to that list. Here is the horrible before. A corner of my living room that has a wet bar. I had previously redone this entire room with the exception of this little corner. Check out those mirror tiles. A box of wine is a must when you live with decor like this. I've been plotting this redo for some time. My plans had to include minimal cost and lack of carpentry. I was not even going to attempt to remove the mirror tiles, definitely not opening that can of worms. I primed everything, painted the hardware, countertop and cabinet. I primed the mirror tiles and applied some killer vintage wallpaper. Yes, there are mirrors under that wallpaper. I think this before/after is smokin'. oh yeah. Smokin is right…this before and after belongs in a magazine! Even the door pulls look awesome now. Great job. I love it! Those colors are great. Love your blog too. Great makeover! You can tackle anything! Amazing! Really, really cute. I love that nothing stopped you, not even those hideous mirror tiles. I never would have thought to just cover right over them. I can’t even tell you how much better that looks…AMAZING…the wallpaper and the countertop totally rocked that space. I can’t imagine having to live with that mirrored bar area – so not you! This rocks as well as smokes! 😉 I didn’t even notice there was a sink until I saw the after photo. Amazing!!!!! Beautiful. I LOVE it!!! You did a wonderful job for sure!!! One of the best redo’s I have EVER seen!! I love the change! It’s absolutely amazing the difference. this belongs in a magazine! AMAZING! what kind of paint did you use on the counter? I need that. now. That’s about the best makeover I’ve ever seen! That looks amazing. I have two friends with ‘wet’ bars that don’t know what to do- I am sending them here. my hat is off to you! you’d never know the before was under there. Good job, it sure is pretty! Thank YOU, thank you, thank you!!! Now I can tell people that they don’t HAVE to live with the uglies. Just think of all the homes you will save. We’re talking major ripple effect here! Most assuredly “smokin!” Good for you! I love before and afters and this is a great one! Good job! smokin’ is right! awesome redo Suzy!!! LOVE it! Really beautiful! You did a SUPER job! Awesome! I never would’ve thought to prime & paint mirrors. Great job! IT’s a great redo! 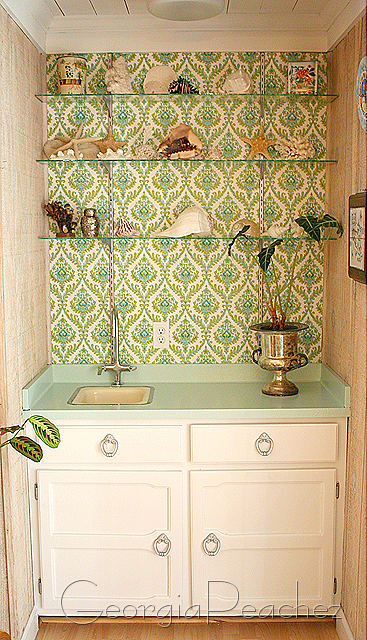 The white cabinetry is perfect with the vintage wallpaper. I’d love to see the rest of this room. That looks fabulous! What a huge difference it doesn’t even look like the same area. 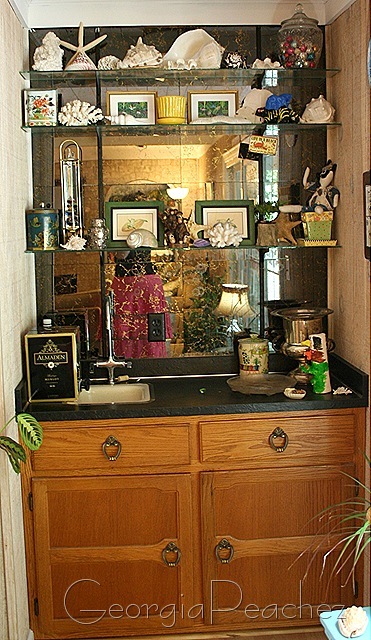 I also have a wet bar and they are very difficult to decorate around! I’m a huge believer in repainting, and your project shows exactly how great paint can be!! Wow! Your after is fabulous!!!! I LOVE it! fantastic! did you use the same paint on the hardware as on the cabinets themselves? I have a similarly ugly cabinet with similar hardware that I’d like to paint. You really did a beautiful job! Smokin’ indeed! This is fabulous Suzy. I absolutely LOVE this makeover – the transformation is AMAZING!!!!! I have an entire wall of oak stained cabinets topped off with hunter green laminate counters. UGH!!! I would love to know how and with what you painted your counter with. I had one of those spaces in my last house.